If you enjoy the fresh air and adventure that comes with the great outdoors, then Outdoor Recreation is the place for you. Our activity and rental office will provide you with a variety of means for adventure for both the land and water dwellers. 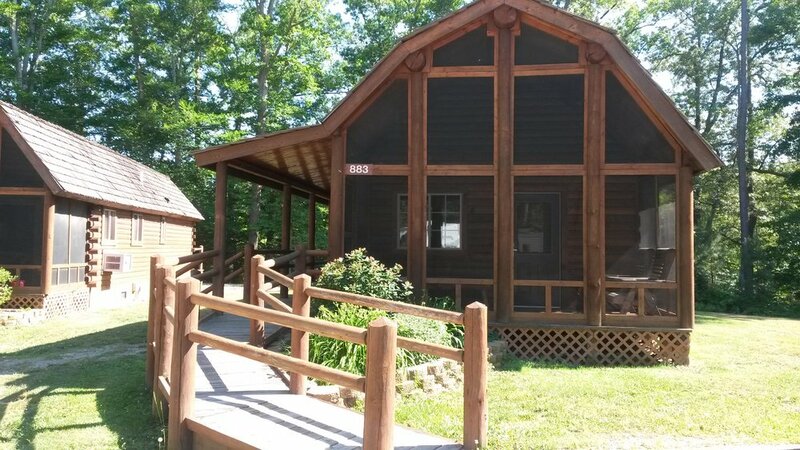 If you are looking to get away from the usual, you can rent out one of our beautiful log cabins or camps sites, or rent an RV and hit the road. For those looking for adventure closer to home, check out our thrilling mini park or hunting grounds. Outdoor Recreation has storage space for your boat, RV or utility trailers at $40 per month, a paved, gated location with key coded access 24/7. Call 878-2610 for more info. ANYONE FISHING ON FORT EUSTIS IS REQUIRED TO PURCHASE A FISHING PERMIT FROM THE OUTDOOR RECREATION BLDG 828 KELLS DRIVE. MONDAY – FRIDAY 0830 - 1630 OR THE PINES GOLF COURSE SUNDAY - MONDAY 0730 - 1530. A FISHING PERMIT IS $10.00 ANNUALLY. MUST HAVE VIRGINIA STATE FISHING LICENSE TO PURCHASE AN ON POST PERMIT. Note: $200.00 deposit is required on all RV’s & Campers. $50.00 cancelation fee will be charged to all cancellations. Cancelations made inside 5 days of pick-up date will result in loss of deposit for RV’s and campers. RV’s and campers may be reserved up to 6 months in advance. There is a two (2) day minimum rental on RV’s and campers. RV’s and campers do not include any amenities such as pillows, blankets, etc. Additional fees: Generator fee is $3.00 per hour. Mileage — the first 750 miles are free and .20 cents per mile there after. Customers must be insured for RV and camper rentals with their insurance policy. Smoking and pets are not authorized in the RV’s, campers, and pop-ups. Equipment must be returned by 0900 on scheduled day of return. You must have the electrical breaking system (Round 7 pin adapter for the lights and brakes). This is also needed for the Enclosed Trailer 7 x 12. Due to liability issues the ODR staff will not load equipment onto customers vehicles. A pickup truck or trailer is required for transport. Blowups weigh between 150 and 350lbs and will take 3 to 4 people for setup. Boarders are responsible for all supplies, feeding, turn in/out of their horse, cleaning their stalls, and providing pads or adequate hay/shavings for their stalls. Stalls must be mucked every other day. The Warwick Pier Pavilion has water and electric hookup at $50 per day. 6 different locations along the James River (Harrison Rd) can be rented at $30 per day. Murphy Field Picnic Area | $50 per day. Unit functions are authorized to use the picnic area free of charge once per year, can be reserved at the ODR rental office. Our riverside location makes Fort Eustis a haven for water sport lovers. Whether you are looking to float around Lake Eustis or take on the peninsula's numerous rivers, our Outdoor Recreation facility has a variety of boating options for you to choose from. Those venturing outside Fort Eustis on a motor driven boat are required to have a State Boater Safety Certificate. Happy boating! At Fort Eustis Outdoor Recreation you have the opportunity to fish on both Lake Eustis, Browns Lake, and the James River. All fishing on Lake Eustis and Browns Lake is catch-and-release only. There is no issue with catching fish on the James River, but please see the Virginia Department of Game and Inland Fisheries Regulations and review the guidelines before throwing a line into the James River. All fishing requires a Virginia State License. Base Fishing Permits are available for purchase at the Outdoor Recreation Office and the Pines Golf Course. All boats come with life jackets. Boater Safety Certificate required for all boat rentals. To tow the boats and trailers you will need a 2" ball with a 4 flat prong for the lights. Canoes and Kayaks do not have a trailer unless you are taking 6-8 of them. Rustic Log Cabins nestled on the banks of the Lake Eustis await your visit. 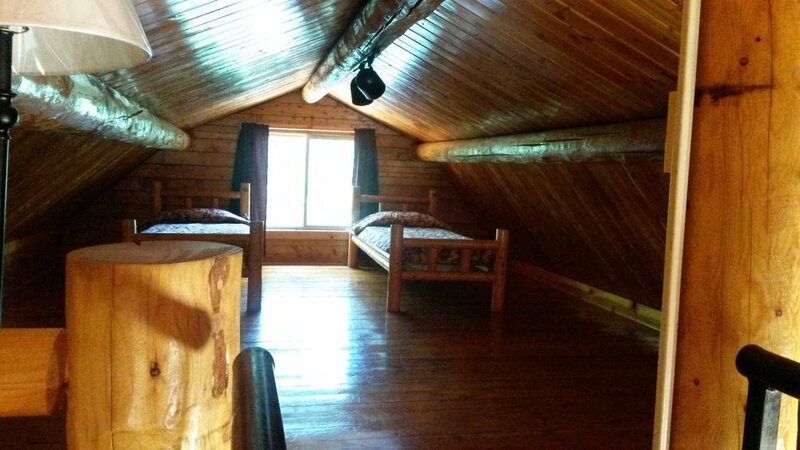 These fully furnished Log Cabins were constructed with your comfort in mind. 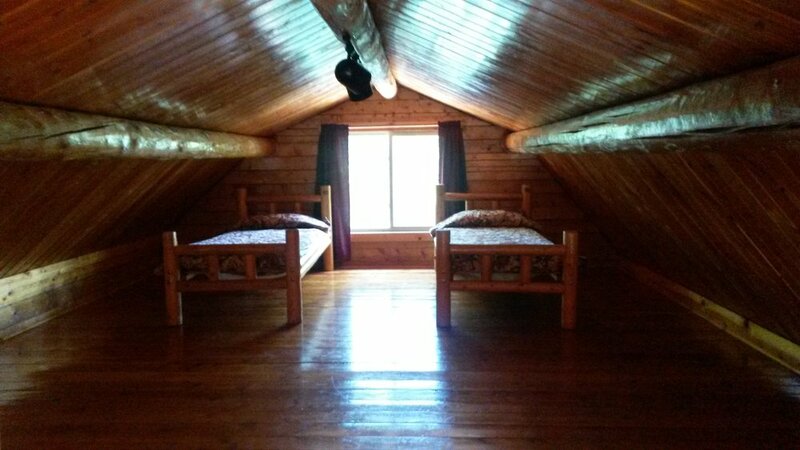 Each of the five cabins sleeps up to 6 people. Central heat and air ensure your comfort year round. 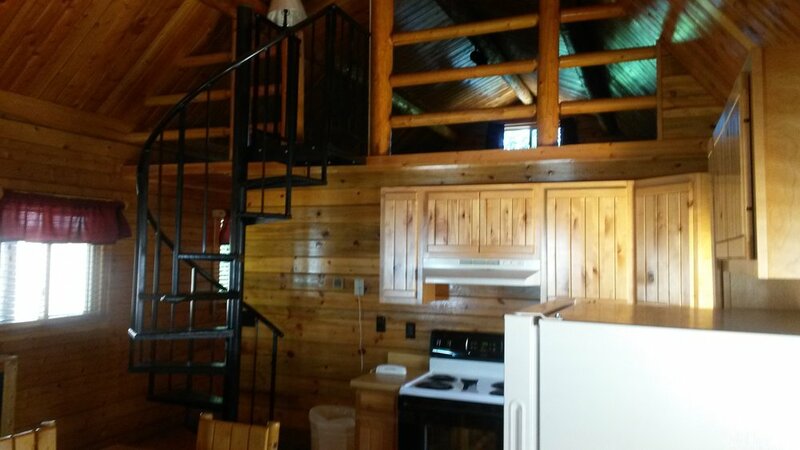 We have 5 log cabins in total, one is completely handicapped accessible. Reservations are taken up to 6 months in advance, with an advance deposit equal to one nights stay. two bedrooms (2 full beds, 2 twins in the loft) equipped with sheets, blankets and pillows. Note: Log Cabins may be reserved up to 6 months in advance. The first night rental fee is due at the time of booking payable with MasterCard or Visa. $50.00 cancellation fee upon cancellation. Cancellations made inside of 5 days and Holiday weekends will result in loss of $85.00. Nine campsites have been designed to blend in with the beautiful flora and fauna surrounding Lake Eustis. These campsites are complete with full hook-ups (water, electric and sanitation), picnic table and charcoal grill. The campsites are available year round and reservations can be made up to 6 months in advance. *Reservations made for 30 days or more will require a 50% deposit and will result in a $50.00 cancelation fee if canceled. Our Mini Golf Course is a challenging 18 holes filled with fun obstacles, sand traps, and a water fall! Come practice your swing at our Mini Park Batting Cages, equipped with 2 fast ball sides and 1 slow pitch soft ball side. Register firearms at the Base Defense Operations Center (BDOC), Bldg 648 Washington Blvd. The required registration forms are AF Form 1314 Firearms Registration, this form can be downloaded at http://www.epublishing.af.mil and DD Form 2760, Qualification to Possess Firearms or Ammunition, this form can be downloaded at http://www.dtic.mil/whs/directives/forms/dd/ddforms2500-2999.htm or you can pick these forms up at the BDOC. Sign Waiver and Hold Harmless Agreement. FEES: The annual Range Permit is $50.00 and expires one year from date of issue. AUTHORIZED USERS: All Active Duty Military, Guard and Reserve, dependents, retirees, veterans with base access, and DoD civilians and contractors with un-escorted access to the installation. Muzzle Loader; 45. 50, 54, and 58 caliber-black powder only, ball and sabot rounds with 150 grain powder limit for all caliber weapons. Shotgun – 12, 14, 16. 20, 24. 28, 32 and 410 gauge only – bird, buck shot and slug ammunition only for all gauges. RESTRICTIONS: Alcohol and drugs are prohibited at all times. Any person determined to be under the influence of alcohol or other drugs are not permitted range access. Wildcat (experimental) handgun and rifle calibers and ammunition are not authorized. be fired from a stabilized mounting platform are prohibited. Fully automatic firing of any type of weapon is prohibited. Only authorized paper targets will be used. Cans, bottles and other objects will not be used as targets. Harassing or firing at wildlife is prohibited. Before anyone may fire on the weapons range they must have someone performing as a safety person on the firing line. Authorized patrons are allowed to bring two guests at a time to the range. A guest is defined as a person that is not eligible to become a patron, i.e., an unaffiliated civilian. A spouse of an authorized patron and children age 17 and younger are also considered guests. Authorized patrons cannot bring other personnel that are eligible to become patrons as guests. Guest are required to be cleared by SFS at 2 Washington Boulevard (Main Gate Inspection Tent) prior to firing. If the guest chooses to fire their own POF's, the weapon(s) must be registered through SFS prior to firing. Guests are not required to complete a Range Safety class or purchase a Range Safety Card. However, in the event a spouse chooses to fire absent of their sponsor, that spouse must attend the RSO class and obtain a Range Safety Card. In addition, all guests are required to sign a Liability Statement, Waiver and a Hold Harmless Agreement, and the Safety Rules which will be available at the range prior to firing. RANGE SAFETY RULES: Safety is everyone’s responsibility and vital while on the range. All patrons authorized to use the range will ensure that all rules are followed. All patrons authorized to use the range must read and sign the range safety rules. Firearms must be unloaded with the breech or action open when on the range and not firing, or while persons are down range. Weapons will remain cased at all times when not on the firing line. Do not handle firearms while people are down range. No Profane of abusive language. Shoes and shirt must be worn at all times. Shoot at approved paper targets only. Shooters needing to go down range will notify the RSO so the RSO can cease firing on the range. Once the RSO acknowledges the range is clear firers may then go down range. Do not go down range unless agreed upon by members of the firing line and the RSO has verified that weapons are safe and cleared. This will be evident when all weapons have been cleared and placed on the ground. Once all shooters have returned to the firing line, the RSO ensures that range is clear and lifts the cease fire by calling “range is clear”. Shoot only from the firing line, and respect the rights of others. Collect personal brass and clean around your area after finishing your shooting session. Firearms must be pointed down range at all times and or in safe direction. Do not point any firearm at any person whether the weapon is loaded or unloaded. Know how your firearms operates. Ensure your firearm and ammunition is compatible. All minors 17 years or younger must be accompanied by an adult. While the minor is firing or handling a firearms, the parent or guardian must remain within the immediate area and are not permitted to fire or handle another firearm. Authorized person must bring their own paper targets. The following targets are not authorized for use on the range; plastic bottles, aluminum cans, metal targets and glass targets. No firing is conducted when visibility requirements for Controlled firing Area cannot be met. Downrange weapon effects are observed to ensure projectiles land within the prescribed range limits. The proper targets are set up and down range. No personnel or wildlife are down range. Announce periodic check fires to permit patrons the opportunity to check targets. All weapons are properly cleared prior to permitting patrons down range. No weapons are being handled while patrons are down range. No smoking on the firing line. No running or horseplay on or around the firing line. Adequate hearing and eye protection are being used at all times. Any patron observing an unsafe act must call for a cease fire. The range must be cleaned prior to leaving. Before leaving the range, all shooters must pick up their spent casings and remove targets from the target stands. For safety reasons there are no trash cans on the ranges; you must take your trash with you.